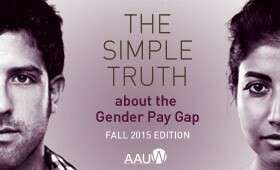 Earlier this fall, AAUW released a special edition of their The Simple Truth about the Gender Pay Gap. They included a wealth of resources with that accessible booklet (which you can download from the web). Why Jennifer Lawrence’s problems obscure the gender pay gap, Oct. 16. Tricky issue of gender pay gap surfaces in White House race, MSN, Oct. 18.